Dating back to the 1870s, Larkmead Vineyards is one of Napa Valley’s most historic estates and has been owned by the Solari/Baker family since 1948. Recognized as one of the most exceptional vineyard sites of the region, the 150-acre valley floor parcel is dominated by Cabernet Sauvignon, with smaller plantings of Merlot, Sauvignon Blanc, Petit Verdot, Malbec and Cabernet Franc as well as a tiny pre-prohibition block of Tocai Friulano. 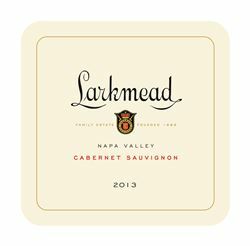 All Larkmead wine is sourced entirely from the estate vineyard and Larkmead also grows and sells fruit for several of Napa Valley’s most prestigious producers. The winery and tasting room is located between St. Helena and Calistoga and is open to visitors by appointment. Tastings at Larkmead Vineyards can be arranged by appointment by calling (707) 942-0167. Larkmead Vineyards is certified under the Napa Green Winery Program by the Napa County Department of Environmental Management (DEM) and the Association of Bay Area Government’s (ABAG) Green Business Program and completed all the regulatory components needed for environmental sustainability. These components included developing water and energy conservation methods, preventing pollution, and reducing solid waste. In addition to developing sustainable winery practices, this program is set to become the standard for the state of California. Larkmead Vineyards is certified under the Napa Green Certified Land Program. Larkmead Vineyards has created and implemented a customized farm plan with measured results that addressed all aspects of its property, vineyard land as well as non-farmed land, including practicing soil conservation, water conservation, stable drainage, riparian corridor enhancement, fisheries and wildlife habitat enhancement and long-term improvement and sustainability.